The main goal in this paper is to use a dual equivalence in automata theory started in [RBBCL13] and developed in [BBCLR14] to prove a general version of the Eilenberg-type theorem presented in [BBPSE12]. Our principal results confirm the existence of a bijective correspondence between formations of (non-necessarily finite) monoids, that is, classes of monoids closed under taking epimorphic images and finite subdirect products, with formations of languages, which are classes of (non-necessarily regular) formal languages closed under coequational properties. Applications to non-r-disjunctive languages are given. Ballester-Bolinches, A, Cosme-Llopez, E, Esteban-Romero, R, & Rutten, J.J.M.M. (2015). 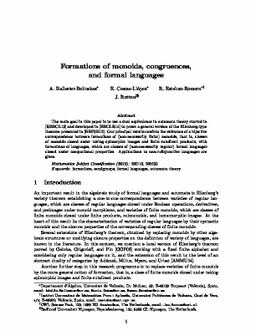 Formations of monoids, congruences, and formal languages . Formal methods [FM]. CWI.